Though Big Little Lies didn’t necessarily wow us here at Paste, last year’s look into the dark secrets of Monterey’s perfect-on-paper families swept like wildfire through awards season and earned the limited series eight Emmys and four Golden Globes. After it was renewed by HBO in December, entirely disregarding the original miniseries format, anticipation for the forthcoming season of the show has steadily grown. Though much of the second season is a mystery—after all, the first season was based on a novel that, as of now, has no sequel—let’s take a look at what we do know so far. Season two will once again follow a story written by Australian author Liane Moriarty, who wrote another original installment of the lives of the ladies of Monterrey, extending the drama beyond the ending of the original novel. Just like season one, it will again be a seven-episode run featuring a script written by David E. Kelley. Replacing director Jean-Marc Vallee—an unsurprising switch, as Vallee has been quoted as saying a second season would “break that beautiful thing and spoil it”—will be Andrea Arnold, known for her Oscar-winning short film Wasp. Vallee will remain involved, however, as producer, along with Kelley on behalf of David E. Kelley Productions, Nicole Kidman on behalf of Blossom Films and Reese Witherspoon on behalf of Hello Sunshine, each of whom are returning from the first season. Much of the cast is returning after negotiating sizable pay raises—Kidman and Witherspoon are said to be earning more than $1 million an episode, compared to $250,000 to $350,000, respectively, during the first season. Shooting wrapped in August of this year, with quite a few of the series’ stars congratulating Arnold on the completion. Feeling so grateful to my #BigLittleLies family on our last day of shooting Season 2! You have all inspired me, supported me, made me laugh & cry. Making the second season even more exciting than the last (I can’t wait for y’all to see it!!) Thank you @HBO and our amazing Director Andrea Arnold! Big love to my sisters @nicolekidman @lauradern @shailenewoodley @zoeisabellakravitz and #MerylStreep. All of the show’s leading mothers have been confirmed to return, including Witherspoon’s Madeline Martha Mackenzie, Kidman’s Celeste Wright, Shailene Woodley’s Jane Chapman, Zoe Kravitz’s Bonnie Carlson and Laura Dern’s Renata Klein. The season has seen quite a few additions to the cast with Martin Donovan and Crystal Fox both joining as Martin and Elizabeth Howard, Bonnie’s parents. Douglas Smith joins as Corey Brockfield, a coworker of Jane’s and aspiring marine biologist (not saying he will be a love interest, but, will anyone be surprised?) Further, Mo McRae and Denis O’Hare are both locked in, the former as a teacher at Otter Bay Elementary who butts heads with Renata and the latter as a new character named Ira Farber. Perhaps the most exciting edition to the cast is that of Meryl Streep, who joins the story as Mary Louise Wright, the mother of Alexander Skarsgard’s frightening Perry Wright. Though Perry was left very much not alive at the end of season one, Skarsgard has played it coy regarding his role in season two and there’s a chance we haven’t quite seen the last of the show’s leading villain, whether it be in flashbacks or otherwise. Streep’s Mary Louise is sure to stir up controversy for the women of Monterey, as her character is returning to the town “concerned for the well-being of her grandchildren” and “searching for answers” regarding Perry’s sudden death. After being spotted on set getting ready to pelt Streep with a sprinkled ice cream cone, it’s expected that there will be quite the showdown between Madeline and Mary Louise, and Witherspoon has (basically) confirmed as much. 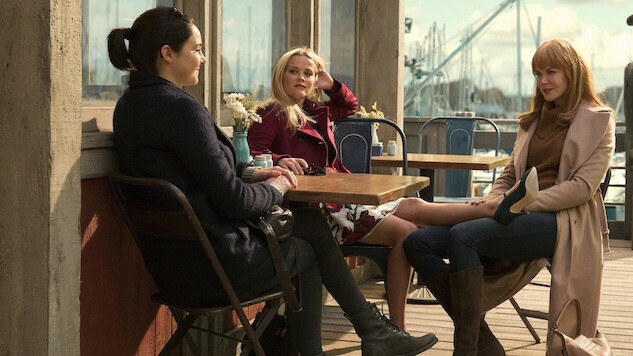 In true HBO fashion (Game of Thrones fans understand this pain), the premiere date for Big Little Lies season two is still a mystery living somewhere in the realm of 2019. To pass the time while you’re waiting, revisit Paste’s breakdown of the looks that made Big Little Lies. HBO debuted the first footage from Big Little Lies season two in a 2019 preview promo video that aired during the Golden Globes. Check it out below.